Researchers at Johannes Gutenberg University Mainz (JGU) and the Massachusetts Institute of Technology (MIT) have made another important breakthrough in the field of future magnetic storage devices. Already in March 2016, the international team investigated structures, which could serve as magnetic shift register or racetrack memory devices. This type of storage promises low access times, high information density, and low energy consumption. 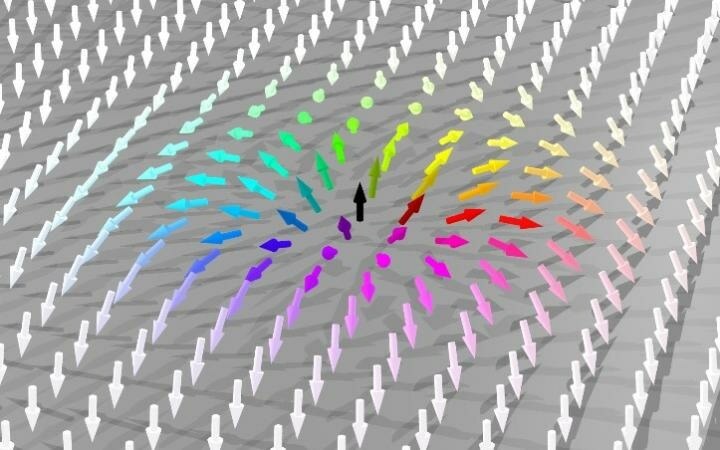 Now, the research team achieved the billion-fold reproducible motion of special magnetic textures, so-called skyrmions, between different positions, which is exactly the process needed in magnetic shift registers thereby taking a critical step towards the application of skyrmions in devices. The work was published in the research journal Nature Physics. The experiments were carried out in specially designed thin film structures, i.e., vertically asymmetric multilayer devices exhibiting broken inversion symmetry and thus stabilizing special spin structures called skyrmions. Those structures are similar to a hair whorl and like these are relatively difficult to destroy. This grants them unique stability, which is another argument for the application of skyrmions in such spintronic devices. Since skyrmions can be shifted by electrical currents and feel a repulsive force from the edges of the magnetic track as well as from single defects in the wire, they can move relatively undisturbed through the track. This is a highly desired property for racetrack devices, which are supposed to consist of static read- and write-heads, while the magnetic bits are shifted in the track. However, it is another important aspect of skyrmion dynamics that the skyrmions do not only move parallel to the applied current, but also perpendicular to it. This leads to an angle between the skyrmion direction of motion and the current flow called the skyrmion Hall angle, which can be predicted theoretically. As a result, the skyrmions should move under this constant angle until they start getting repelled by the edge of the material and then keep a constant distance to it. Within their latest research project, scientists of JGU and MIT now proved that the billion-fold reproducible displacement of skyrmions is indeed possible and can be achieved with high velocities. Furthermore, the skyrmion Hall angle was investigated in detail. Surprisingly, it turned out to be dependent on the velocity of the skyrmions, which means that the components of the motion parallel and perpendicular to the current flow do not scale equally with the velocity of the skyrmions. This is not predicted in the conventional theoretical description of skyrmions. Part of the solution of this unexpected behavior could be the deformation of the skyrmion spin structure, calling for more theoretical effort to fully understand the properties of skyrmions. "I am glad that the collaboration between Mainz University and MIT has already yielded the second high-ranked publication. Considering especially the short time since the collaboration started, this is exceptional and I am happy to be able to participate in it," said Kai Litzius, first-author of the Nature Physics article. Litzius is a scholar of the Graduate School of Excellence "Materials Science in Mainz" (MAINZ) and a member of the team headed by Professor Mathias Kläui. "In highly competitive fields of research such as that on skyrmions, international cooperation with leading groups is a strategical advantage. Within only two years after the start of the collaboration with our colleagues from MIT, we have already published the second time together in a high-ranked Nature group journal. The MAINZ Graduate School of Excellence facilitates research stays of PhD students from the United States in Mainz and vice versa and therefore contributes significantly to international education and successful research in this field,” emphasized Professor Mathias Kläui of the JGU Institute of Physics, who is also Director of MAINZ. Establishment of the MAINZ Graduate School was granted through the Excellence Initiative by the German Federal and State Governments to Promote Science and Research at German Universities in 2007 and its funding was extended in the second round in 2012. It consists of work groups from Johannes Gutenberg University Mainz, TU Kaiserslautern, and the Max Planck Institute for Polymer Research in Mainz. One of its focal research areas is spintronics, where cooperation with leading international partners plays an important role.